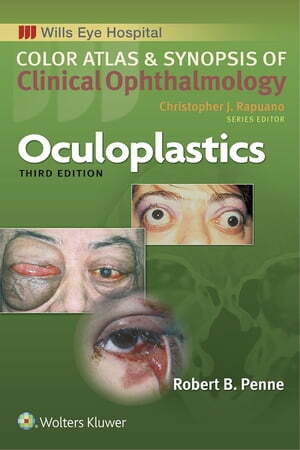 Collins Booksellers - Oculoplastics by Robert Penne, 9781496366870. Buy this book online. Publisher's Note: Products purchased from 3rd Party sellers are not guaranteed by the Publisher for quality, authenticity, or access to any online entitlements included with the product. Developed at Philadelphia’s world-renowned Wills Eye Hospital, the Color Atlas and Synopsis of Clinical Ophthalmology series covers the most clinically relevant aspects of ophthalmology in a highly visual, easy-to-use format. Vibrant, full-color photos and a consistent outline structure present a succinct, high-yield approach to the seven topics covered by this popular series: Cornea, Retina, Glaucoma, Oculoplastics, Neuro-Ophthalmology, Pediatrics, and Uveitis. This in-depth, focused approach makes each volume an excellent companion to the larger Wills Eye Manual as well as a practical stand-alone reference for students, residents, and practitioners in every area of ophthalmology.